The Back Again/2000 Remote Agent with a “server key” enables high performance backup and restore of remote OS/2 Servers, including IBM OS/2 Warp Server, Warp Server for eBusiness and eComStation (with a JFS data partition) over TCP/IP based networks. The CDS Remote Server Agent protects all system files, including file security information, the operating system, applications and data. The Remote Server Agent has options for software data compression for maximum throughput, while saving space on the backup device and data encryption for complete security. 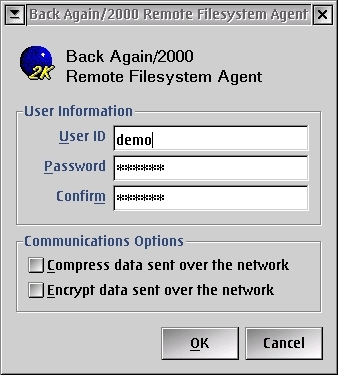 The Back Again/2000 Remote Agent with a “workstation key” protects IBM OS/2 Warp 3.0, Warp 4.0, and eComStation (without JFS data partitions) clients in a networked environment. All files on remote workstations are protected, including the operating system, applications and data.